The FIRST-IN™ PRO Sidepack is built for the professional, built to take in what you need when you arrive on-scene. 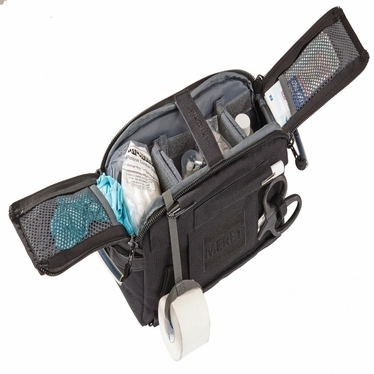 Built from the strongest materials and a smart design, and the versatility to modify to your requirements, the FIRST-IN™ PRO delivers a lightweight solution that can carry and organize all of your basic supplies and protective equipment to address immediate patient needs until additional assistance arrives. The FIRST-IN™ PRO is a hands-free solution, ergonomically designed for use as a sidepack or shoulder/cross-body bag. Using EZ-Grab pull bars, the two top panels of the FIRST-IN™ PRO quickly open to a main compartment that can be customized for small and large items using the innovative SLIDERs system. Flip-out™ webbing straps allow you to attach tape rolls that can be rapidly deployed while they are still attached to the bag. Shears, pens, and pen lights can be inserted and secured into their respective pouches on the front of the bag for easy access. Reinforced side webbing offers dual radio and pager mounts. A stress reducing waist belt system uses wide webbing, a large easy-to-use buckle, and a padded lumbar pad to reduce pressure on the side or lower back. Using the included shoulder strap, the waist straps can be concealed into a rear compartment to convert the FIRST-IN™ PRO into a shoulder bag. Designed with TS2 Ready™ system functionality, the FIRST-IN™ PRO has interchangeable TS2 Ready™ components and offers the ability to attach an additional TS2 Ready™ module to the front of the bag depending on your requirements. The FIRST-IN™ PRO is available in blue, red, and tactical black (non- reflective). Modules and supplies shown in images are not included. Product Dimensions: 7.25" x 12.5" x 5"